Like most patzers suffering yet another slump in form, I dream of quick fixes, of slaying Masters with off-beat openings, oh so cunning psychological ploys, and strategical simplicities. In this latest slump, I mean the word dream quite literally however. I woke up this morning with the sequence 1. g3 d5 2. Bg2 Bf5 3. c4 e6 4. Nc3 d4 5. Bxb7 dxc3 6. Bxa8 marching through my mind like a victorious army, fanfares streaming, trumpets blaring, the final position held aloft on fluttering banners, my kingly emerging consciousness reveling in imaginary victory. [Today's post was written before yesterday's comments came in. As you may already have seen, Davee got the right next move while T.C. and David Sedgwick identified What Happened Next. 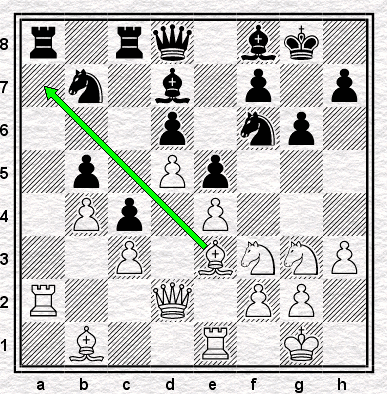 Yesterday we left John von Neumann considering the ninth move of a game he was playing at the 1993 World Open. Given that he had just three legal moves to chose from, and only one that was even remotely plausible, you might think that what he did was was play 9. bxc3 pretty sharpish. 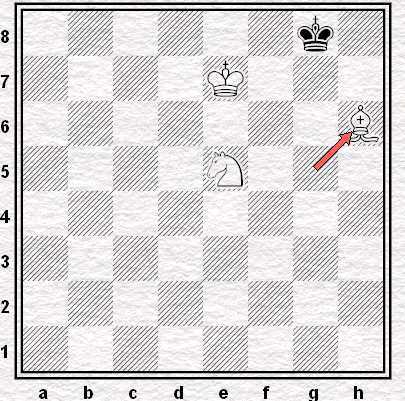 In fact that was the move that White chose, but it wasn't What Happened Next. When faced with the position at the head of today's blog what von Neuman did first was nothing whatsoever for forty minutes. 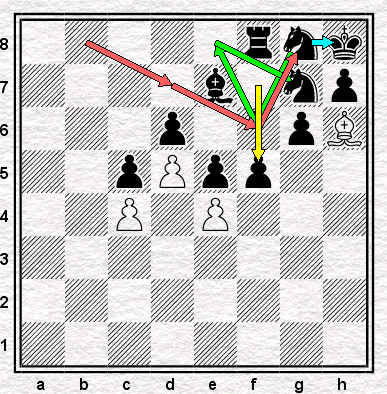 How did he come to take so long over an absolutely forced move? Did he get drunk and fall asleep at the board a la Tkachiev? Did he nip to the toilet and get himself locked in a cubicle? According to 'Shoes on Fire', Hans Ree's excellent article on the case (republished in The Human Comedy of Chess, Russell Enterprises Inc. 1999), von Neumann did neither of these things. During that extended pause he didn't leave the board at all. He just sat there staring at the ceiling. Jigger-all might have been what the man behind the White pieces was doing, but there was some activity at his board nonetheless. At some point a spectator approached the table, took a note of the position and then scurried away. 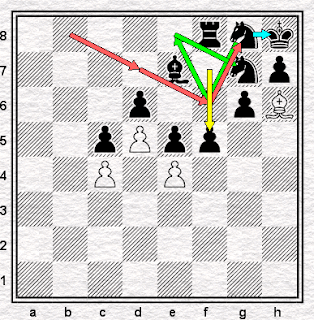 It was only some time after this had happened that von Neumann roused himself and managed to make move. So, what actually was going on during von Neumann's long think? With the benefit of hindsight it seems he was probably starting the chess world off on a ride that would lead directly to the French team's shenanigans at the Olympiad last year. I say "probably" because precisely what it was that von Neumann was up to in Philadelphia has never been proved for sure. Most likely, though, he was using a computer to help him win chess games. If he was, I believe that would make his case the earliest recorded instance of such behaviour at a chess tournament. Should we accept von Neumann's - presumably unintended - claim to a place in chess history? Let's review the rest of the evidence. von Neumann's catatonic episode alone would be enough to get noses twitching. As it happens, though, it was not the first time during the tournament that his behaviour had aroused the curiosity of his fellow competitors. 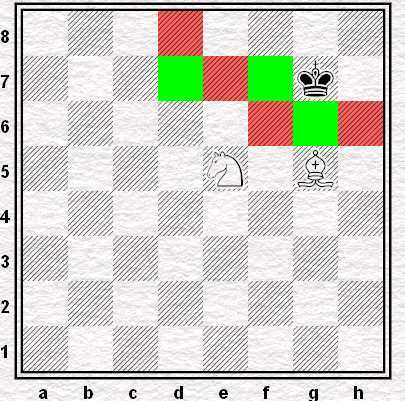 In the fourth round, for example, he lost on time after 9 moves. 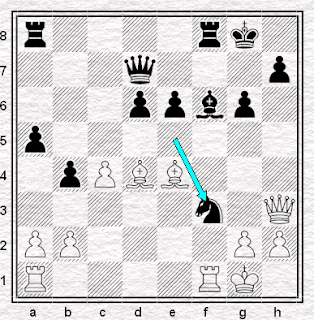 In the second, though unrated and unknown, he managed to draw with a Grandmaster - Iceland's Helgi Olafsson. "I was sure I was playing a complete patzer, he had no idea what he was doing and I even thought he was on drugs. He took way too much time to reply to obvious moves and he was very strange. But I made a bad mistake in the opening and I was punished with a draw." Still, the odd spanner in the works not withstanding, von Neumann's World Open was successful enough that he secured $800 by sharing first place in the unrated section. The Tournament Director had become suspicious, however, and suggested to our man that he both prove his identity and take part in an independent test to demonstrate his chessing skills. At this point von Neumann took to his heels never to return, the prize money that he'd 'won' left uncollected. If we deduce from this strange behaviour that von Neumann must have been cheating in some way, what is there to suggest that the employment of silicon-based assistance was his method? Well there's the taking of several minutes per move over even forced recaptures (Ree speculates that the mega-long think in the eighth round was the result of a transmission error and von Neumann playing 8. Bxc3 instead of the machine's recommendation of 8. bxc3) for a start, but most telling of all is his name. 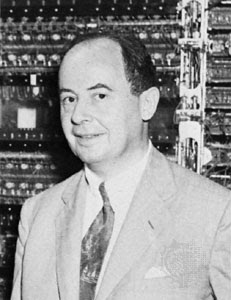 John von Neumann was a mathematician who'd made important contributions in the field of computer science amongst other areas. Not the guy at the '93 World Open, another J vN. The chess tournament von Neumann was a "black American with a Rastafarian hairdo" (Ree); the computer geek was born in Hungary. 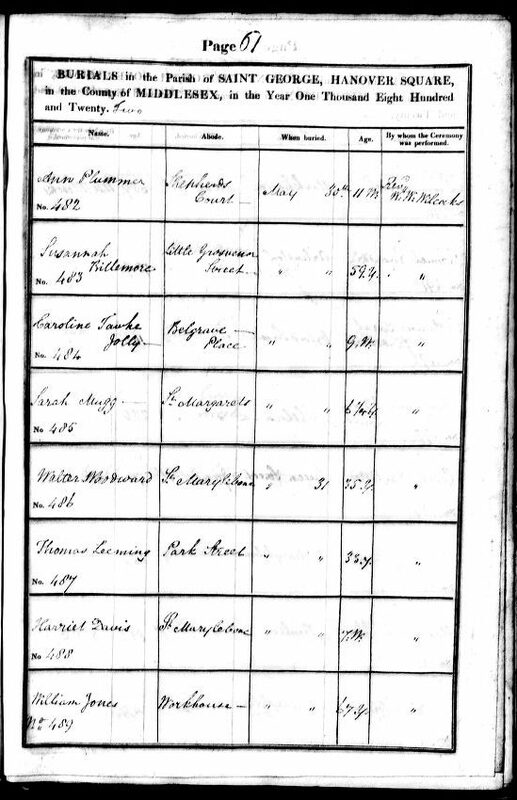 As biographical details go, being black and being Hungarian are not necessarily mutually exclusive, I suppose, but being dead and playing in chess tournaments definitely don't go together [although ...]. Since the Hungarian computer bod John von Neumann died in 1957, I think we can assume that the fellow at the World Open was not him, but an impostor. Unlikely don't you think, that somebody clearly up to no good would choose that particular nomme de guerre were he not benefitting from the help of a Bloody Iron Monster ((c) Michael Stean)? So, yes, I think we can conclude that on the balance of probabilities the '93 World Open von Neumann was the first chesser to be seduced by a computer's charms. Eighteen years on Feller, Marzolo and Hauchard are surely not the last to follow in von Neumann's footsteps, just the latest*. Two decades ago, a man who will almost certainly never be identified brought a genie out of a bottle and we're never going to get it back in. The question is, how much damage will von Neumann's legacy do? * as the Bard of Barking would say. ... reaching the position at the head of today's blog. So, What Happened Next? The answer, should it not appear in the comments box in the meantime, will be revealed in a bonus post which will be published tomorrow morning. "... if the brilliant Twin Peaks can't make chess on TV any good, then what possibly might?" So asked T.C. on the 9th of this month. I suggested The Wire, but Tom thought chess didn't play a big enough part in that marvellous programme for it to count. On that basis we'll have to ignore a Doctor Who story from the Tom Baker era (shame), but perhaps I can interest you in an episode of Blake's 7? Don't like any of them? Well, feel free to browse our video archive for a few more possibilities (some of which might even still work), or, if you'd rather, stay on this page a watch Doctor Who: Curse of Fenric in its glorious entirety. Yes, it's Sylvester McCoy, the worst-ever Doctor; yes it's Ace the third-worst-ever companion (behind only Bonnie Langford and Catherine Tate), but dagnabbit, chess is central to the whole story. Bonus question: why might Ace's mum be a fan of our humble blog? With thanks to Dominick Zwolinski for the tip. The Nice Olympiad was played between Karpov's demolition of Spassky in the Candidates' Semi-Final and his - in the end - much closer match against Korchnoi in the Final. 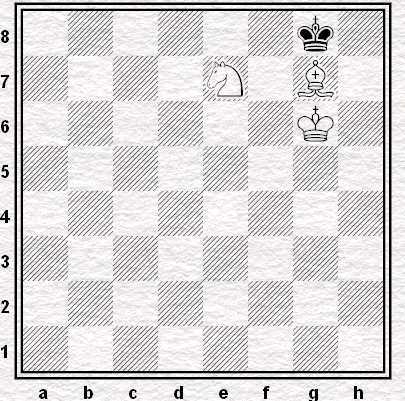 Karpov played on top board, and won the gold medal by an enormous margin. The Olympiad, and the defeat of Spassky, arguably mark the point at which he established himself as the strongest active player in the world. This would remain the case for another ten years. I don't know where I first saw the Unzicker game with its brilliant, original bishop move. There were two Batsford compliations of Karpov's games, but the first one came out in 1974, gave the score of only one of the Spassky games and nothing played thereafter - I didn't see the later, updated edition issued in 1976 - while the second gave his games as World Champion 1975-78 (or 1975-77 if, as noted here, you believe the front cover). Either way, the Nice Olympiad wasn't included. But I must have seen it somewhere. Wherever that was, though, I don't think I understood it. When writing a previous entry in this series, I speculated that Karpov might have been inspired to play his famous knight retreat against Spassky by Nimzowitsch's even more famous knight retreat against Rubinstein. Maybe. Perhaps what impresses me most to this day about Karpov's bishop move - which captures nothing, attacks nothing, threatens nothing and delivers no check - is not just its seeming anonymity but its apparent originality. Of course those more erudite than I may know of a precedent, and quite conceivably Karpov knew of one himself. But as it stands, I know of no previous game from which the grandmaster, with all his enormous acquired knowledge of themes and possibilities, may have plucked this concept. 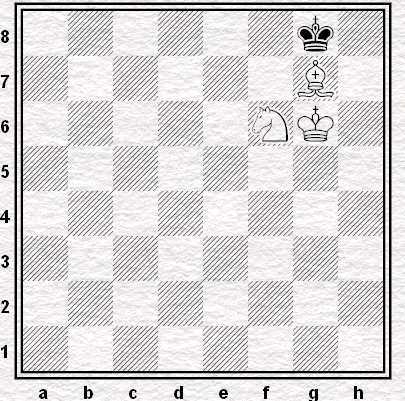 Nimzowitsch was known for his mysterious rook moves. Karpov's was a mysterious bishop. It's still difficult to get my head around the purpose, the power of the move. In the short term, it prevents Black exchanging rooks and then taking over the a-file. I can see that. 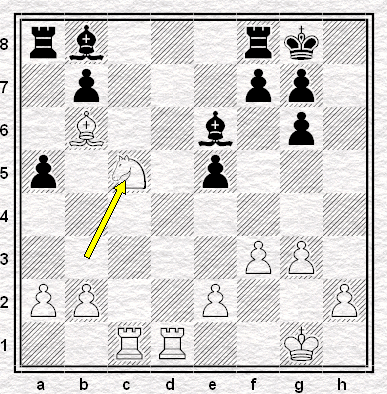 And after it has moved, it gives cover to White to double his rooks on the a-file. I can see that too. Except that after that, none of those pieces goes anywhere. Not the bishop, not the rooks. There's no effort to penetrate on the a-file. No effort to do anything. And with no effort, White wins the game on the other side of the board. 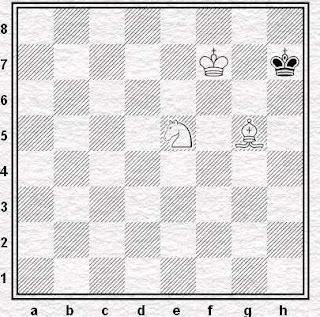 In one way, simply counting pieces, I can't see why White isn't tying up as many of his own as his opponent's. 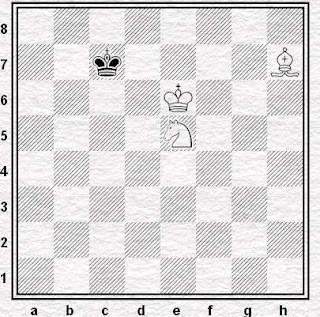 If I count a few more moves, though, I can see that Unzicker was reduced to moving his king from side-to-side, and then a few moves later, having to resign. "It is permitted to lose to Karpov with Black", was his reaction. 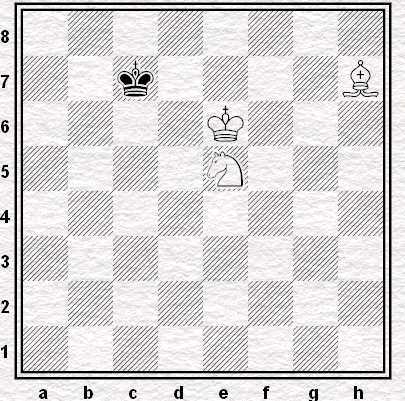 Fischer's 1963 win over Robert Byrne was memorably described as "more witchcraft than chess". It was - and so was this. Good beyond comprehension. Perhaps we might adapt Arthur C Clarke and declare any sufficiently advanced chess to be indistinguishable from magic. You may recall that last year I suddenly started suffering time-trouble, and that when I decided to do something about it, I played like an idiot and began losing all over the place. Well, the good news is the time-trouble is back. The bad news that I'm still losing. 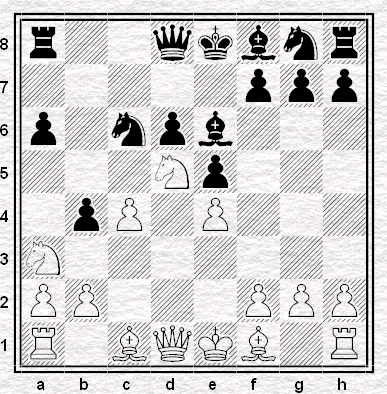 Now, white has maintained a slight advantage throughout the game. But despite his lead in development I felt sure I could equalize in this position, the symmetry and two bishop justifying this expectation in general terms. I started off by analyzing 22...Bxa2 23.b3 a4 but felt this still left my opponent an edge, and my intuition told me there was something better. Minutes went by and the something better remained elusive; with time-trouble looming I indeed ended up playing the obvious 22...Bxa2 23.b3 a4. 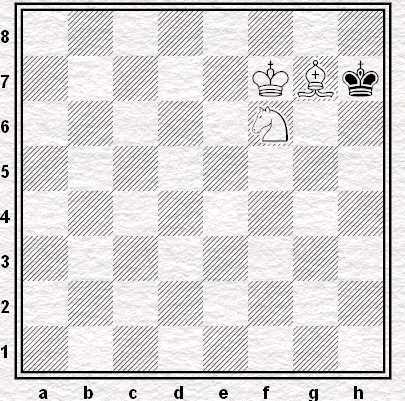 White went on to exploit his enduring edge and claim the whole point. But, my intuition was right: black can equalise in the above position. Can you spot how? With the clock ticking? Analysis and the game to play through after the jump. We live in interesting and difficult times. In days of yore the path of the righteous man might have been beset on all sides by the inequities of the selfish and the tyranny of evil men (as Jules would tell you), but right now simply knowing where the road is supposed to be in the first place is far from straightforward. Take Libya for example. It’s only two shakes of a lamb’s tail since we were snuggling up to old Gaddafi and yet here we are firing a gross of cruise missiles up his chuffer because it turns out he’s a bit of a cad after all. Who could have known? Anything that happens in the chess world is entirely inconsequential in comparison to the news from North Africa or Japan, but we are, nevertheless, no less awash with moral problems than anybody else. Be they global and significant (e.g. 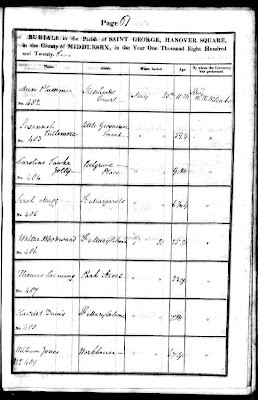 Frenchies cheating at the Olympiad and the subsequent inquiry; the game's ongoing relationship with Kirsan and whether or not that’s OK), local and relatively trivial (e.g. the Surrey County Chess Association having a team captain who who has been banned from playing at an internet chess site – or two? – and whether that’s OK), or some combination thereof (e.g. Lara and Michael Stock’s recent exploits in New Zealand) we seem to be surrounded by ethical dilemmas just now. Given everything that's going on it seems rather strange that it should be so difficult to make a profit publishing a magazine devoted to Planet Chess, but that's economics for you. Apparently the situation has become so dire that the British Chess Magazine has resorted to an email appeal for new subscribers. 200-300 more in the next few weeks or it's curtains, they say. Coincidentally or otherwise, shortly before sending that email the new(ish) BCM editor, Steve Giddins, had deleted his blog* from the interweb. Whether there is a direct connection between its going and the appeal for new subscribers, or whether he took it down in the midst of a hissyfit, I have no way of knowing. Either way, however, it seems to me that the disappearance of the Giddins Blog in particular, and his reaction to the Stock/New Zealand shenanigans in general, shed a little bit of light on the difficulties the magazine are facing just now. I rather fear that requests for the chess public to subscribe to the BCM out of sympathy are doomed to failure. The structural problems facing the print media as a whole not withstanding, however, it is just possible that the BCM editor - albeit inadvertently - might have given his employers a hint as how they might start to dig themselves out of their predicament. I'll get back to what Giddins' take on the Stocks might say about the BCM's troubles in a moment. First, for anybody who's missed it, I'd better review what happened down under. Chessbase publish a story saying that a WGM and her 2200+ rated father have been caught using false names to enter an under-1700 tournament in New Zealand and, not surprisingly, making off with the prize money (the princely sum of $55). Pictures of the pair are published, but they are not named. 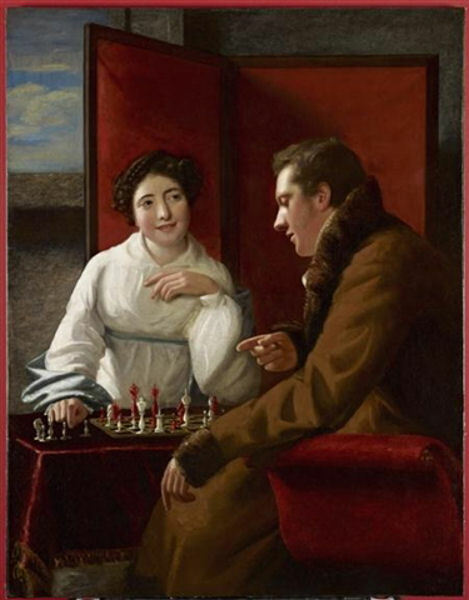 Chess Vibes, referencing a post on an Australian chess forum, identify the pair as Michael and Lara Stock. Giddins picks up the story in a blog post. He calls for Ms. Stock to be stripped of the WGM title and banned from international chess for life while lamenting that this is unlikely to happen because, "chess has never had a governing body that has taken action in such cases". As a by-the-by we might also observe that our man doesn’t feel able to name the object of his ire (he refers to her as "the odious little wretch") and, curiously, at no point does he find it necessary to say what punishment he thinks would be fitting for her father. There's a little bit of afters at the Giddins blog. 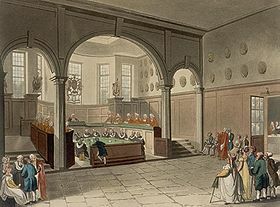 The Stocks (as before he isn’t naming them and he continues to more or less ignore Stock Sr.) have still got him hot under the collar – "utterly outrageous behaviour", "a criminal act of fraud", "[s]he is a crook, and should be treated as such" etc. – but for the most part he has redirected his fire and he now has the entire "chess world" in his sights. The real problem, he says, is the game’s "fundamentally misaligned moral compass". Those who disagree with his stance on the shenanigans in New Zealand, he tells us, "betray a very worrying lack of understanding of the basics of moral philosophy". I have taken down my blog and will not be engaging in any further punditry on matters in the chess world. If even a voice of intelligence and reason like yourself [Wohl - JMGB] cannot see the seriousness of what happened in NZ, then there is no hope for chess. Have a good life, all of you, but it's not a life I want any part of. What are we to make of all this? Clearly, Giddins is absolutely right to argue that the small amount of money gained in no way makes the Stock's behaviour acceptable. Yelping on about "fraud" and life bans is ludicrously over the top, but that doesn’t mean that he is wrong to condemn their actions. The problem, need I say it, is Giddins' suggestion that nobody other than himself has any understanding of ethics. While the opportunity to learn something of the basics of morality is most welcome, one has to wonder about a moral compass which insists that the Stocks be denounced and yet apparently allows a long-standing relationship with Raymond Dennis Keene. If cheating some amateur chessers out of a few quid the other side of the world is wrong – as it obviously is – why has Giddins never had anything to say regarding his investigations into, amongst other things, Raymondo’s past dealings with Tony Miles, the evidence of his plagiarism or his agreement with Korchnoi which included a clause prohibiting RDK from writing a book about the Baguio World Championship match of 1978 and which he signed just after he’d put his name on a contract with Batsford confirming he would do precisely that? Perhaps because he's too busy playing Smithers to Raymondo's Mr Burns? 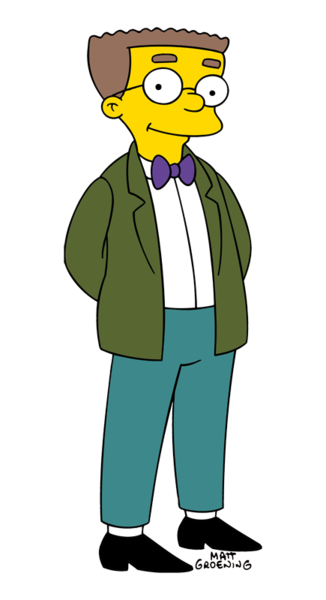 Enough with the Simpsons riff. Let's move on to what this has got to do with a chess magazine getting itself out a tough spot. It seems to me that there are three morals to be drawn from this tale: the wisdom of deleting a blog, the value of "punditry" and the little matter of Giddins/Smithers himself. Whatever motivated the act, from a business point of view Giddins' decision to remove his blog was almost certainly a mistake. A presence on the internet is a great opportunity for a magazine editor to engage with his readership. More importantly, it's the best kind of advertising you can get - an opportunity for potential subscribers to get an idea of the kind of writing that they might expect to receive if they were to hand over their cash. That said, if you use the internet to give your potential customers an idea of who you are and what you're about, insulting them is probably not a good a good plan. Cultivating the impression that you're perfectly willing to strike out at soft targets far far away while ignoring less comfortable issues and opponents nearer to home is similarly unwise. If you're looking for customers, to me it seems self-evident that a blog or some other internet presence is a good idea. What, then, to put on it? What to say about Giddins' apparent aversion to 'punditry'? Once again I feel his decision has not done his employers any favours. "You get 12 issues, 56 pages per issues (sic), with news, instructional articles, annotated games, chess history articles, problems, studies, photos etc." The trouble with much of this - especially the news and games, but also the problems/studies/photos too - is that an awful lot of people can get their fill of it for free on the internet. They won't have to wait around a few weeks for a magazine to pop through their letter box either; it's just right there in front of them. As I mentioned the last time I wrote about chess journalism, if a magazine can give us one thing that the internet can't it's the time and space needed for the interpretation and explanation of the world around us - or, to put it another way, punditry! I happen to think that Giddins was along the right lines with his writings on the Stocks, he just needs to do it better. There's nothing wrong with polemic as long as it's not providing an argument that an obvious hole in the middle of it. Sure, there's nothing worse than a boring pundit, but that's no reason to entirely turn your back on this area. Quality specialist columns/opinion pieces are perhaps the one thing that might just help save chess-related print media. Finally, then, we turn to the man himself. On paper he must have looked like a good candidate for the BCM Editor's chair. I'm not sure, though, that it's turned out that way. I've never read one of Giddins' books, but looking around the internet you won't often find anybody who's got a bad word to say about them. Quite the contrary, in fact. Giddins, the chessbook author, is evidently held in some esteem by those who've read him. Unfortunately, as a journalist the reverse would seem to be the case. The problem is that he rather gives the impression that he divides the world into two categories: those worth sucking-up to and everybody else. This wouldn't be so bad if he could manage a neutral attitude towards the latter group, but he does rather seem to enjoy treating them (i.e. us) with disdain. For those who recall Giddins' fondness for references to "termites", that he announced the end of his blog with a "screw you all, I don't want anything to do with any of you" flourish will not have come as a surprise. 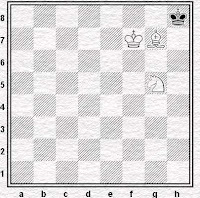 "Unfortunately, the future of the British Chess Magazine is in the hands of John Saunders ...."
as one EC Forumite felt the need to say about Mr G.
So that's my recipe to help turn things around at the BCM: Giddins needs to change his ways or be replaced; the editor, whoever it is, needs to find a formula that can't be replicated on the internet; and the BCM staff need to embrace the internet and engage with their potential and actual readership. Would this be enough to make a difference? Is it even possible? To be honest, I don't know. It could well be that whether it's Steve Giddins at the helm or anybody else, the BCM simply isn't a viable entity any more. One thing I'm pretty sure of, though, is that asking people to subscribe to a magazine for no other reason than to save it from extinction will, at best, only delay the inevitable. The folk in charge of the BCM need to come up with some new strategy or there's a good chance that I'll find myself digging out that gravestone picture again some time soon. * I am indebted to Roger de Coverly and Justin Hadi from this thread from the EC Forum for tip-offs regarding the demise of the BCM Blog and the comment at Alex Wohl's blog. Quality magazines will survive, but I'm quite sure that whether it turns out that we dig its grave in the short-, medium- or long-term, old-school chess journalism is inevitably doomed ...."
"I didn't understand why you were playing on. I should have been more careful." When I heard this I looked over to see a bishop and knight facing a lone king, a scoresheet with an awful lot of moves ticked off and, very obviously, no mate on the board. 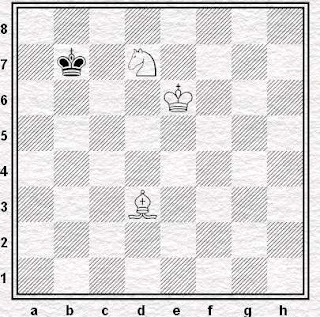 I took a guess at what must have happened over the last fifty moves: our man had let his opponent sacrifice a piece, or perhaps even a rook, for the last pawn and then found he wasn't able to win the ending. Ouch! It could easily have been me. At the time, just a couple of months ago (shortly before I started writing this series in fact), I wouldn't have known how to mate with bishop and knight against king either. I think I'd always assumed it would be beyond me. It does, after all, have the reputation of something that's incredibly tricky to do. Oh deary me. If an 2550+ GM can't do it, what chance does a club chesser have? None you might think, but here's the thing: while it's virtually impossible to work out over the board, if you do know what you're doing it's really rather straightforward. OK, you could say that the chances of this ending arising coming up in actual play are so remote that it's not worth learning anyway. This, in any event, is Silman's justification for not covering KBN v K in his book (Complete Endgame Course, Siles Press, 2008). Having spent a fair bit of time on it over the past few weeks, however, I'd have to argue against this point of view. It's worth studying, I think, not so much because of all the extra points you will get, but because in doing so you learn how bishops and knights work together. So feel free to ignore the rest of this post if you'd rather - you're more than welcome just to pop back to Kempinski - Epishin and have another chuckle at a Grandmaster proving himself to be just as incompetent as the rest of us - but, for those who want it, here's a beginner's guide for how to mate with bishop and knight. I'm sure it's not the only way, I doubt it's even the quickest way, but it will work and it's practical in the sense that it comes down to remembering just three simple positions. Still with me? Good. 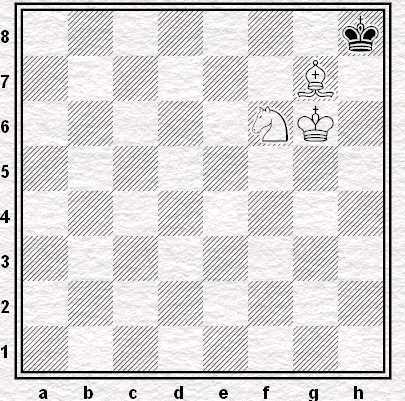 Here we go with how to mate with bishop and knight against king in five easy stages. The technical information in what follows is based on what I learned from Pandolfini's Endgame Course (Simon & Schuster 1988). What I've tried to add is a little something to help make the process a touch easier. Anyhoo, like Pandy, I’m going to go backwards and begin with the end. The first stage of learning to win bishop and knight against king is to know the positions in which checkmate is actually delivered. There are quite a few, all of them with the enemy king trapped in a corner of the same colour as your bishop [If you have read this far then congratulations - you already know more about KBN v K than Epishin did in 2001: JMGB]. In fact it is possible to deliver mate in the ‘wrong’ corner, but these positions can’t be forced so ignore them. A tip I picked up from Geoff Chandler (in his section of Master Chess: A course in 21 Lessons) is not just to look at the diagrams below and say ‘ah yes’. Instead, get a chess set out and actually set them up on a board. Seeing them in 3D, or perhaps just going to the effort of doing this, really seems to help burn the mating patterns into the brain. The other thing that you should do is not just focus on mating on or around h8. Repeat the exercise for each corner on the board. When you have to actually do this for real your opponent might not be cooperative and put his king where you’d like him to. Once you've done this, the next step is to solve mates in two, three and then four. Pandolfini’s Endgame Course gives five such exercises - pretty good - but, like far too much of the book, one of them is marred by a misprint. but after 15 minutes of trying I could only find a mate in four. When I looked at the solution the first move is Ng6 check! The King’s supposed to be on h8 – very annoying. 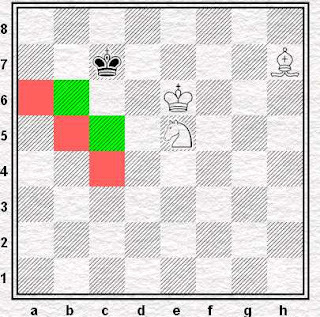 Anyhoo, you might want to amuse yourself by finding the mates (start with the king on h8) before moving on. After you've got the basic mating patterns firmly in your head, it's time to move on to what Pandolfini calls “The Lock”. Have a look at this position. 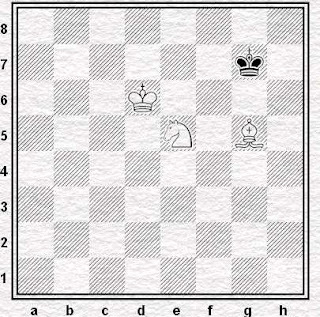 White seems to have Black’s king surrounded, but when you take a closer look you realise it doesn’t just appear that Black might be in danger of becoming trapped: he actually already is. In fact, the bishop and knight are doing all the work on their own. 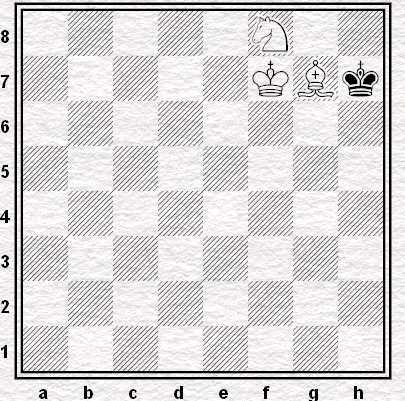 White doesn’t even need the king to keep Black under control. 1 … Kf8, 2 Kd7 Kg7, 3 Ke7 Kg8 (otherwise the king gets even closer) and now 4 Bh6! 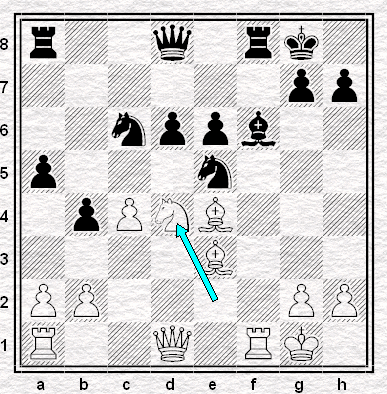 This is how you get from Pandolfini’s lock to a position where mate is imminent. How you do you get to Pandolfini’s position in the first place? That’s the next stage. Before you move on, though, it’s worth practicing the lock in each corner and going sideways as well as up and down. You can’t force a checkmate with the opposition king in the ‘wrong’ corner so that's where the other guy is going to run with his king. What we have to do is force him across (or down or up) the board to the right place. In the basic starting position for this phase the bishop can be on any square on the b1-h7 diagonal. It could also be somewhere between a2 and g8 too, although in that case we would be pushing Black’s king down to h1 and not a8 which is where he’s heading here. This is a critical position. Pandolfini doesn't pay much attention to it, but in my experience (and playing out the ending with T.C. he seemed to have a similarly difficulty) what follows is very difficult to grasp. Got it? If not, this should help you work out where the pieces should be. It’s easy enough when you know how, I think, but a real bugger to visualise in advance if you don’t know what you’re looking for. Anyhoo, 6 Ne5 Kc6, 7 Bd3! and Black’s king has nothing better than 7 … Kb7. From here, you need to know how to get to Pandolfini’s Lock. It shouldn’t be too difficult to work out how (quick review, you want the bishop on b5, the knight on d5 and the king somewhere around e6). When you’ve got Phase Three down it’s time to put the whole thing together. 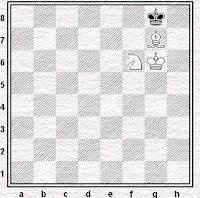 Set up the position at the beginning of this stage and force checkmate via the bishop/knight/king formation you learned in Phase Two. This is pretty much where Pandolfini leaves things. We have a couple of more stages to go though. So, you’ve practice mating that lone king with your bishop and knight every which way. You can start in any corner and go up down or across according to your will. You’re so familiar with The Lock that you can visualise it several moves in advance. but ultimately it won’t do him any good. 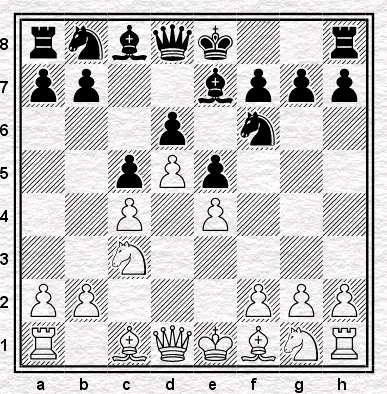 In fact sometimes it saves White time and we can mate a move or two quicker if Black plays like this. 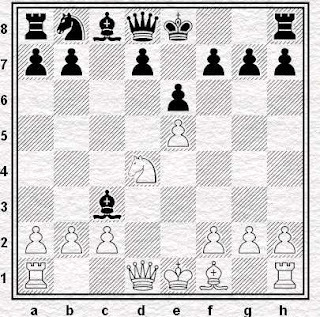 Not that for practical play we’re particularly bothered if we give checkmate after 19 moves or 20, but it’s good practice to work out what to do if Black tries these other moves. After you’ve done all that there’s just one thing left to do, and that’s solve a problem that may already have occurred to you. 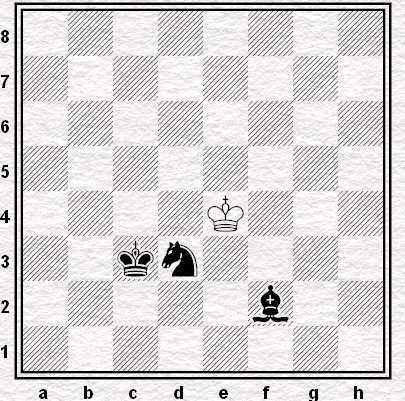 Mating from the wrong corner is fine, but how do you get that lonesome king into the wrong corner in the first place? I’m not sure there’s much of an answer to that except just to practice. Set up the pieces in random positions and just do it playing against a computer or a friend or just moving the other king yourself. Here’s a couple of test examples that you might want to try yourself against. Readers who’ve been with us for a while might remember EJH winning this ending a year or two back (you can find out how he did it here). 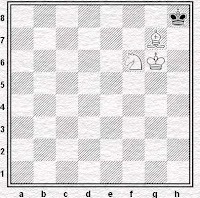 It’s also a good idea to make things as difficult for yourself as possible by starting with the enemy king in the middle and your pieces scattered around the edge of the board. Here’s a position I set up and played out against myself (my computer tends to head straight for the wrong corner anyway which isn't much help). I’m not saying that how I finished Black off is the best way, but it’s effective enough and that’s what we’re aiming for – the ability to mate with bishop and knight in a practical game when we need to and not theoretical perfection. Keep these in mind and the hardest thing you’ll have to do is maintain your patience while you wait for the opportunity to demonstrate your knowledge! Good luck. Oh, and if you do manage to mate somebody in this ending, whether a result of this post or not, do let us know. We'd love to hear from you. Let us enjoy a change from the unsound-sacrificial-nonsense that has previously characterised this series and consider, instead, a rather different approach, which nevertheless resembles its apparent opposites in that I have only ever played it once. Mind you, that's once more than most people have played it: I don't think that I have ever seen it played, and I suspect most club players aren't even aware that such an opening exists. Not that I played it in a club game: I played it in a simultaneous, one hosted by St Mary's Junior School in Royston, which was a feeder school for the secondary I was then attending in Stevenage. This being so, I wasn't sure whether it really counted: I'm not including email games (let alone internet games) in this series, if only because one can try any old rubbish in a non-competitive game, but given that the opponent was Bill Hartston, and I was taking him very seriously, I chose to include it. If only because, as I say, you don't get to see a lot of Czech Benonis otherwise. WHY I PLAYED IT: The offhand answer to this would be, "because I was young and naive": the more mature and considered answer would be, "because I was young and naive". There's several smaller questions of "why" wrapped into the larger one, anyway. One is ""why did this obscure defence particularly appeal to me? 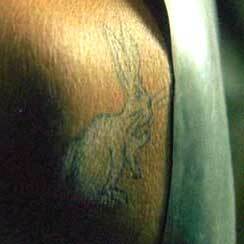 ", but we'll leave that one aside for a minute, since we have neglected to enquire where I found it. WHERE I FOUND IT: A 1977 Batsford book called Benoni, which is incorrectly called The Benoni on Amazon, and which was written by one William Hartston. This last fact prompts the intermediate question "why did you think it would be a good idea to play this opening against the bloke who wrote the book on it?" which might even have occurred to me at the time. Although I was never good enough to be invited to the simuls, frequent at the time, in which top British juniors took on top overseas grandmasters, I naturally read about them and I can distinctly recall that juniors preparing to take on Lev Alburt were advised not to play the Alekhine, Alburt being then the world authority on that defence. I do also, however, recall not really understanding that advice. Either way, whether it was given before or after I played Hartston using a defence that he understood and I did not, I didn't take any notice of it. As to what appealed to me - I think it was the weirdness of the opening. 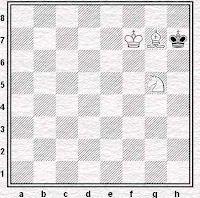 This was the pomp of British weirdness (Skara had happened the previous year, Basman was probably at his best, and Ray had spent much of the previous decade winning with the Modern) but this was a different kind of weirdness, not a provocative, flank-pawn weirdness but a cramped, block-the-centre-and-your-own-pieces weirdness of a sort I'd never come across before. 3...e5. What did that do? As far as I could see it didn't do anything. Then 4...d6, which was necessary, I supposed, but what was it doing for the black-squared bishop? 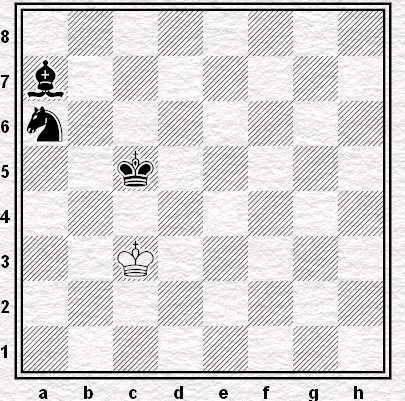 Then next move, 5...Be7, Black actually marches that bishop towards the blockade. It didn't look much like the Benoni I'd seen Fischer play. After reading Hartston's book for a while, though, I got the idea. Or I got the idea that there was one real idea. 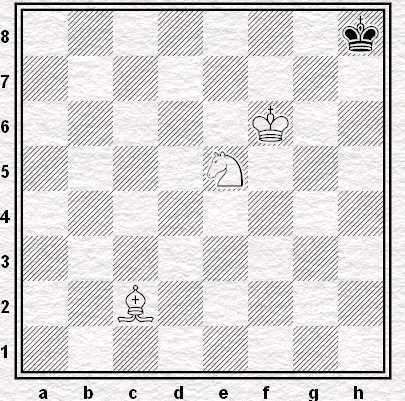 It went like this: Black plays ....Nbd7 and then ...Ne8. (I liked that, moving the knight backwards.) 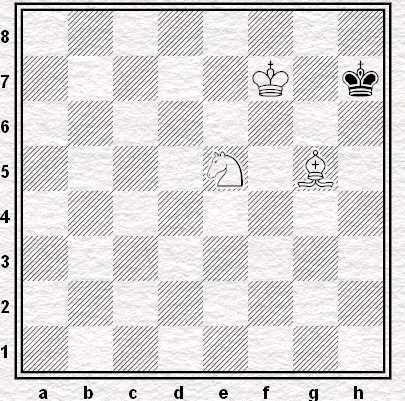 He then plays ...g6 to which White replies Bh6 . Then Black replies ...Ng7 and subseqeuntly with ...Kh8, ...Nf6 and ...Ng8 (hurrah!) drives away the Bishop, breaks with ...f5 and attacks. I like it! I've always loved a plan. Of course there wasn't only one idea. You could also hope that White would play f4, to which you could then reply ...exf4, ...Bg5 exchanging off the bishop and then pick up the outpost with ...Ne5, and win that way. Which, as it happens, is how a highly-rated junior called Emms had beaten me in a tournament the year before. Taking the opening to be much more significant than the difference in our ratings, I was naturally fascinated by this performance and chose to give it a go myself as soon as I could. Which, given that hardly any juniors, then as now, actually played 1.d4, and few club players at the level (124) at which I was then competing, was not soon. But Bill Hartston played 1.d4. So I played it against him. WHY I STOPPED PLAYING IT: Because I didn't understand it after all - or that was the impression I got from the game. I didn't understand what happened if the plan never quite happened. I didn't understand why he let me have the b-file and why I then couldn't do anything with it. After the first few moves I didn't really understand anything, except that my pieces never had any good places to go to. Perhaps the difference in strength between us played, again, less of a role in my thinking than it might have done. In truth, and not for the first time in this series, looking at the game now, I don't think I did so badly. I might have found myself in a passive position without meaningful counterplay, but he was a British Champion and I was just a kid. (I wonder, actually, whether this game didn't give me the powerful fear of having a useless queenside knight in blocked-centre positions, which has often, and helpfully, been on my mind when playing the Ruy Lopez.) 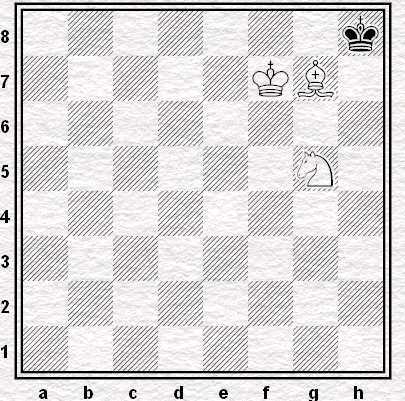 White has a quicker win at move 31, and again at 33. But at least I didn't get smashed in twenty moves: I knew enough for that. That said, as an opening, it probably is too difficult to handle for a teenager with a teenager's normal attacking instincts, one without much positional sophistication and one who isn't much superior to the normal run of his opponents. I can see how the teenage John Emms would have fared well with it, forever being allowed to swap off his bad bishop and put his knight on e5. But it would never have suited me, not at the age of 15. As it happened, shortly afterwards, I discovered another Benoni with a simple plan, the Benko Gambit, and that kept me going for a few years - rather longer than a single game, though I never really worked out what to do against 2.Nf3. (That annoying move-order is my normal choice as White today, though not especially because it avoids the Czech Benoni.) Until I eventually I gave it up, and resumed the search for the perfect defence to 1.d4. Which search, I assume, will never come to an end. CHANCES OF MY PLAYING IT AGAIN: But isn't this a silly question? Isn't the whole point of "once was enough" to say that once was enough, that you know you'll never play it again? That's what I thought. I gave it up all right: years and decades passed and I never considered taking it up, even though, at one time or another, I seem to have tried almost everything else. But I never forgot the plan. And there was a game in Worcester, in 1998, a Nimzo-Indian in the Leningrad Variation, in which I found myself playing ...Nf6-e8 and ...g6, then ...Ng7 in response to Bh6, then ...Nd7-f6, ...Kh8 and ...Ng8 followed by ...f5. Isn't that great? I wish I could play all my games that way. I lost in the end, but never mind. It's the plan that gets me. I think it was the first real plan I ever came across, and sometimes it needles me, reminds me of its existence, tempts me to give it another go. It wouldn't have suited at the age of 15...but might it suit me more at the age of 45? It needles me. It bugs me. I recall punting 1.d4 c5 2.d5 e5 in an email game that I wrongly, and expensively, thought was unrated. That was three or four years ago. Then, about a year ago, just to see, I played 1...Nf6 in a club game, with the idle thought of giving the proper Czech a whirl against 2.c4. Alas, there came 2.Nf3 and something stodgy (if anybody planning to play the Czech Benoni can complain about stodge). And just a few months ago, I was shopping on Amazon and came upon Richard Palliser's book on the Czech. I Looked Inside. I read the pdf. I put it into my shopping basket. And then I put it back. I'm tempted. I shouldn't be tempted, but I'm tempted. But I don't know that I'm tempted quite enough. Back in January I wrote a post about getting into time-trouble, and afterwards I decided to manage my clock more circumspectly. The result? Less time-trouble, but terrible results: my average grade for the season before the decision was 207, afterwards 188. For our international readers, that's about the same as a loss of 150 Elo points in form. Brilliant! Now, yes, it's only been half a dozen or so games since The Decision, and since 207 represents an over-performance maybe there's just some averaging going on; on the other hand, when I look over my games I start scratching my head, wondering what was I thinking. Or rather, what wasn't I thinking, and how did I miss that. But judge for yourself. Here are three examples given in the form of puzzles, all taken from a recent game (the one game which I actually managed to win, incidentally!) Solutions follow after the jump. I had the black pieces. A who's-move-ordering-who open Sicilian, and I've just played 9... b5-b4. 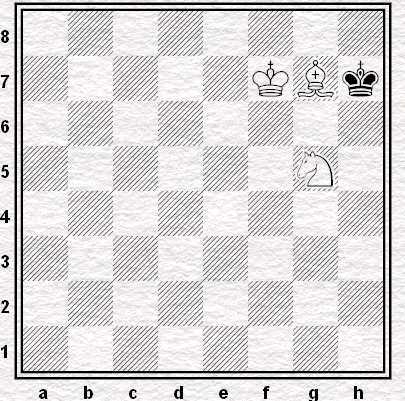 The position is known to theory and my opponent played 10.Nc2, one of two normal moves. But the other I had not remotely considered. Can you see it? 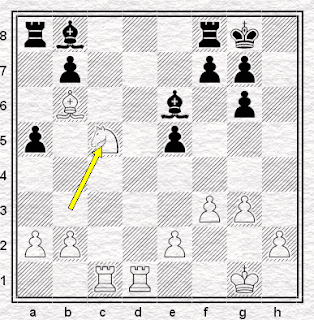 White's sacrificed a pawn for a bit of pressure on the h1 to a8 diagonal, and the position is quite complicated too. Now, I was pretty convinced that after the forced sequence 19...Nxd4 20. Bxa8 Nf5 21.Rxf5 exf5 22.Bd5+ the position would be close to equal, with white's better pieces compensating for his pawn minus. But I decided I wanted more and played 19...Qd7 instead. Had I analyzed the position correctly? Black's extra pawn is looking better and better, and I've just played 22...Nf3+ to simplify matters. 23.Qxf3 loses, 23.gxf3 is ugly, and I wasn't sure which of the other two captures to worry about most. What should have I worried about most? ejh: What encouragement and support do you think they could receive that they presently don't? RJ: I'm not involved in this side of things at the moment so I can't really comment very much. From some of the posts by parents on the English Chess Forum there are those who think that there should be more coaching sessions, perhaps more places available in the World and European Junior Championships, that the selection policy should be improved and so on. But all this costs money and the money probably isn't there. This is a serious letter on my part to enquire exactly who is The British Chess Federation and what is it exactly that they do for British chess generally. My reason for asking both these questions is that as a mother of an up and coming junior - and a non-playing mother at that - I am seriously wondering why the B.C.F. 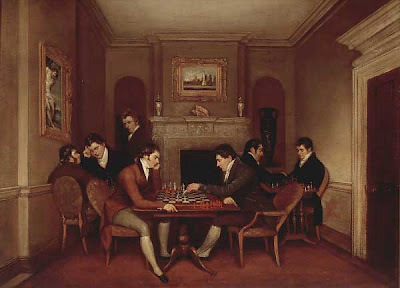 do not play any part in the training of our talented youngsters and also why it seems to be left to various other people to arrange chess activities of a more visionary nature - thus providing conditions in which I feel that chess should be played. I really hardly need mention the names of any of these people. But without them Julian's progress would certainly have not been so pronounced in the last few years. But I will name them as they deserve most of the credit for our recent successes in the international field. (That is my view anyway). They are of course - Jim Slater who seems to provide quite a bit of money required, Leonard Barden whose efforts on behalf of juniors in general seem to be pretty endless, Eddy Penn and Peter Morrish who probably know more about hard work than most of us. And Stewart Reuben. Even though the latter never eats anything I give him when he comes round to dine with us! I was staggered to learn that the B.C.F. registration fee is only 50p. Is that really true? It hardly seems worth collecting in my opinion. Perhaps if they were a little bit more realistic in this direction they would have a little more money to promote British chess more fittingly. Also I feel that the prize money at the British Championship is pitiful. And why could not genuine discussion take place with a view to investigating the possibility of opening a Chess Centre in London. But with 50p's darting about I can see that it might be rather beyond their means. However, I must not sound too carping. Chess has given Julian so much and I hope that he will be able to repay the game and its followers in the years to come. I just wish someone would wake the B.C.F up. Plus ca change, I suppose, but which was the year of publication?